This quarter, I would like to bring attention to the latest development between the Calgary Humane Society and the online marketplace, Kijiji. Now, everyone should know by now that searching for a new pet through websites like Kijiji is generally a bad idea. Everyone should. But, because it remains prolific, clearly they don’t. Why are Kijiji sellers bad? Easy. Because there is no transparency or regulation. Online pet sales are where puppy mills, backyard breeders, and accidental breeders do their business. And as soon as your money goes into their pockets, you have helped them to profit and condoned their practices. • Backyard Breeder: A backyard breeder breeds an animal for financial gain and not for the purpose of betterment of the breed, with little or no thought regarding the consequences for or the well-being of the animals. Backyard breeders usually breed animals without proper regard for pedigree, proper planning for future homes, spay/neuter planning for offspring, and/or little knowledge of proper rearing techniques. • Puppy Mill: “A puppy mill is a breeding operation in which dogs are repeatedly bred for financial gain and are kept in substandard conditions” (Ontario SPCA, as cited in No Puppy Mills Canada, 2001). • Accidental Breeder: An accidental breeder is someone that has not had his/her animal spayed/neutered and an unplanned breeding occurs as a result. Many animals end up in shelters as a result of such accidents. Failure to control animal breeding is connected with other forms of neglect. These three categories of breeders play a significant part in buyer misinformation and pet overpopulation. Ease and price often cause the public to seek out these sources for new pets, rather than researching reputable breeders or adopting from a shelter or rescue agency. Rescue agencies have long been aware of this fact and have made endless attempts to educate the public. And now the Calgary Humane Society is blazing a trail with a new strategy. Earlier this week it was announced that CHS and Kijiji have teamed up to regulate breeders selling pets online. The CHS will inspect and certify online breeder listings through a new Breeder Inspection Program. Approved breeders will then be given a particular badge on their ad that acknowledges their certification and CHS approval. To earn the badge, the CHS must approve the provided space and shelter, sleeping conditions, supply and quality of food and water, the number of animals in the home, general cleanliness, and vet inspections. There will be follow-up inspections to ensure the “breeders” remain credible. 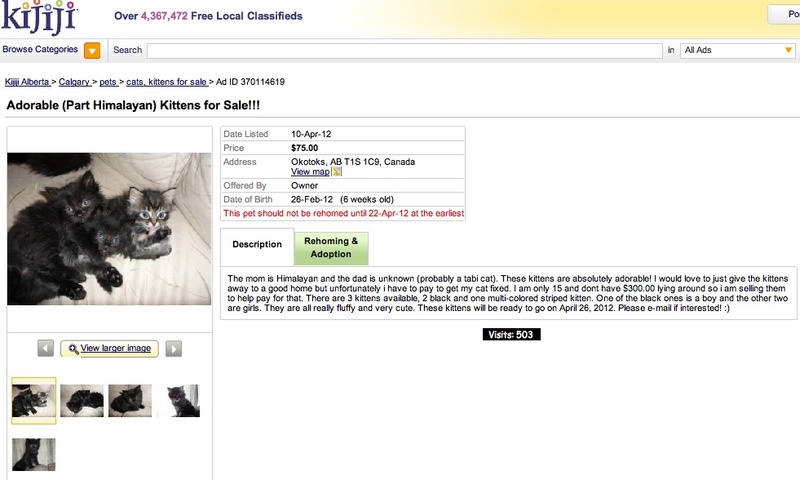 One of over 300 Calgary ads for cats/kittens currently on Kijiji - also an example of an Accidental Breeder. Now, before you start nit-picking, I request you acknowledge the innovativeness of this new idea and that is really is better than nothing. In fact, I must remind myself of that, as cynicism often takes over. 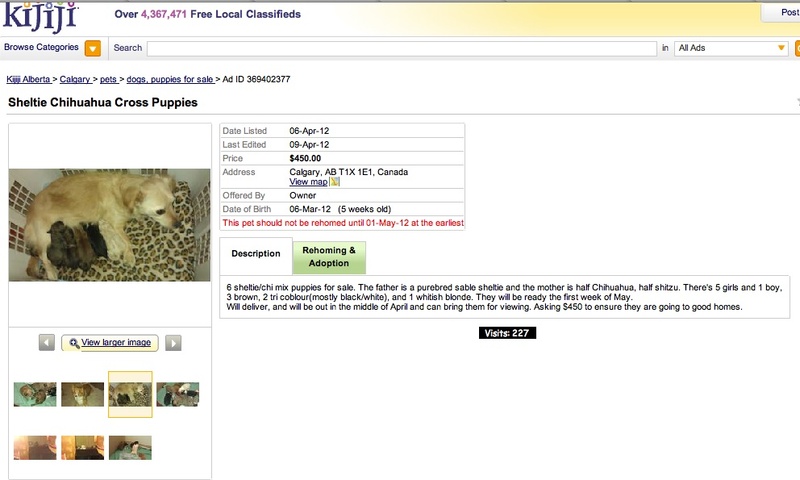 Do I wish Kijiji ads were now limited to ONLY breeders who receive CHS approval? Sure. I mean, this badge strategy will not reduce the number of pet ads online, nor will it make it more difficult to advertise on Kijiji or find a pet breeder on Kijiji. Do I wish the solution was a bit more active than passive on the part of buyers? Of course. People will still be able to see non-CHS approved breeders in with the CHS-approved ones, and only people who’ve heard about the program will know to look for a CHS logo. Not to mention it does little to stop the impulse purchase of that cute kitten based on a picture – regardless of what badges appear. Do I wish we educated the public so greatly that they didn’t go to Kijiji for a pet in this first place? Indeed. This may be considered an example of treating the symptom and not the problem. But you know what? As I said, it’s still better than nothing. It’s a concrete step forward that other cities have yet to take. And if it causes just one person to re-think their potential purchase of a backyard bred puppy, then I say a small improvement is better than none. And if the press release about the partnership educated more people about the perils of online pet ads – great. There are many pieces to the puzzle of pet overpopulation. This is one. It would be a mistake to think we’re done now, though. To watch the news report on this program – and see ASLC’s comments – check out the CTV video by clicking here. One of over a thousand current Calgary Kijiji ads for dogs/puppies. To see what others are writing about for Blog the Change for Animals this April, view the list by clicking here. Writing from Calgary, Alberta, Canada. 90% pictures of my dogs; 10% miscellaneous opinions nobody asked for. I remember when Kijiji first announced that it was going to allow pet ads. Thousands of people signed petitions asking them not to do it. They obviously didn’t listen. I’m hopeful that this is a big step towards putting those “bad breeders” out of business. What concerned me was that the online seller has to initiate and pay for the inspection. If most people going to Kijiji are purchasing based on price and speed of transaction…and there is no means to filter by postings w ‘badges’ (understaning they wont be visible until you open the ad) how can we expect seller but-in when they’re this will cut in to the profit they’re trying to maximize by listing for free? It is a great first step, lets hope a lot of online stores will follow ! But they are not doing anything to highlight whether health clearances have been done or not. IMO that is one of the most important pieces of the puzzle. If it is an intentional breeding then let’s see the clearances. If not, then say it upfront. If they are going to look at food and water, let’s talk clearances too. Here is the thing though, people who buy from so called backyard breeders and/or puppy mills/puppy brokers don’t really care about all of that stuff if it means that they might pay more for the dog. I know because I have talked until I am blue in the face to people about the proper health clearances for the breed they are interested in. The answer I get back, “but I only want a pet and I don’t want to spend a couple of hundred more for a pet with clearances”. Or they want the so called designer breeds that cost more up front because well they are “designer” or “rea cup”, (again no health clearances). So I am wondering if that badge will cause people to think they are getting something they are not? However, I do not have a problem with a person finding a puppy online. Petfiner is just a huge online puppy/dog seller. There is a fee so they may say adoption, but it is selling and honestly I think many rescues are not candid about the dogs they advertise, but that is another subject….lol. A step in the right direction is better than none taken, of course. You are absolutely right. I do hope it leads to more protections for the animals in question. We all have a LOT of educating to do before buyers make better choices, regardless of what badges sites offer or don’t. 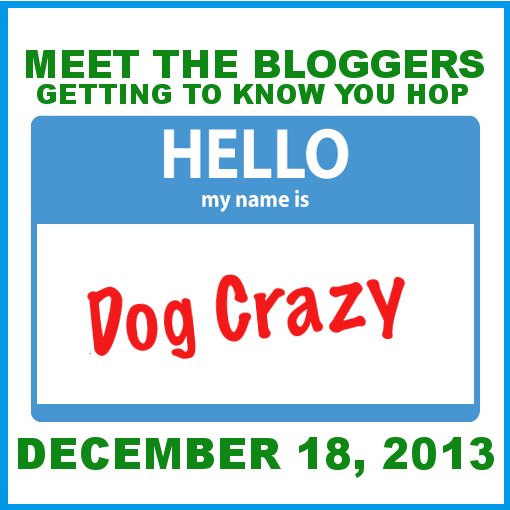 Thanks for Blogging the Change, Jen. It’s always a pleasure to read your thoughtful posts. Hey it’s Jet here. Thanks so much for keeping the light on this issue. In our area it’s that Craig’s list thingie. Our rescue gets notified often with situations gone horribly wrong. It’s a step. That’s all that we can ask for at this point in time. Anything that may get people to think twice is a good thing. 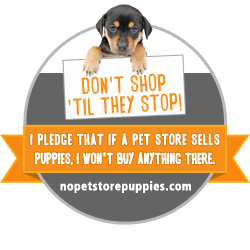 Anything that may help stop backyard breeders and puppy mills is a good thing. Kudos to the CHS and Kajiji for making the effort to rein in unscrupulous breeders. A difficult situation with no easy answers, to be sure, but any positive steps taken are truly appreciated! Thanks for this news Jen. I’ve always hated those Kijiji ads. At least now, more people will notice there is a *difference* from ad to ad. Hopefully this will help them wake up to the fact that there are better choices. Baby steps are better than nothing… I definitely agree. I hope that this is just the beginning and that things continue to change. They were trying to get a puppy protection rating system in place here on Long Island for the actual pet stores (it has not yet come to fruition, if ever). I feel the same way about it – is a great program? No. But it is a step in the right direction. Change comes one step at a time. First they look at how well the animals are treated, then next can be health clearances like 2 brown dawgs mentioned, etc., etc., Not perfect. But a start. In the past I have commended Kijiji for its efforts to educate pet buyers. Short of banning all pet sales completely I think they have done a great job in promoting responsible breeding and purchasing. Especially in comparison with similar sites. It’s especially wonderful they have formed a partnership with an organization as progressive as CHS. Thanks for sharing the good news! It may not be perfect but it is a big step and I think it should be acknowlegded. I’ve honestly never heard of this Kijiji. I’ll have to go check them out. If they’re anything like Craig’s list then I have to at least give them credit for taking a step in the right direction. Every move forward counts, every opportunity to offer education is a good thing. I’m sure we’d all like to see more but change comes in small steps. Thanks for reporting this news. I think it’s a great first step. If I were a responsible breeder I would certainly pay for the certification and then advertise as such. When people see that “Approved CHS Breeder” it may make them research to find out what that is about. There is so much wrong in the animal industry it’s nice to see someone doing something! So I’m two months behind… sue me. Tell ME what to do. 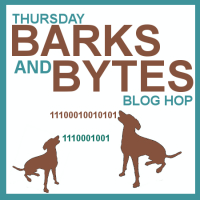 I know someone who is a backyard breeder– he and his spouse-equivalent make about $1,000/year with a litter of faux-Yorkies and a litter of faux-Persians. No papers, no guarantees, just $250-$400 a puppy/kitten, depending on how old they are, cat or dog, etc. I’ve told them that I think it’s wrong. They think I’m an idiot. They are very good to their pets, there’s no abuse going on, but for every animal they sell, another dies in shelter. It’s a free market, it’s not illegal, but it makes me crazy all the same.